Before you know it, you’re spiraling into a world of negativity, which can ultimately hurt your performance. Everyone who competes will experience some pre-race nerves, but luckily there are things you can do to control them long before they start—saving your energy for what really matters. Spend a little time at the beginning of your training cycle thinking about your reason for taking on the challenge in the first place. This will not only help keep you focused during training but can be used as “power button” when those pre-race nerves threaten to drag you down. Once you know your motivation, print it off, keep it in your phone, or post it somewhere prominent. I’ve actually even written it on my arm on race day! Similar to your motivation reminders, mantras are short, powerful statements that help focus your mind during tough times (e.g. for me my swim mantra is “always on feet” and my run mantra is “I have this, lets go.”) Use these pre-race (and during your event) to help keep you calm, centered and in the moment. If you’re reading this, it’s likely that you’re already tracking your training to optimize performance—but your training log can also be a powerful counterbalance to pre-race nerves. Logging your training data, milestone rides/runs and how you felt during each can help incrementally build confidence. That means practicing starts, eating the food you plan to eat, and starting your training sessions at the time of day you’ll be starting your race. 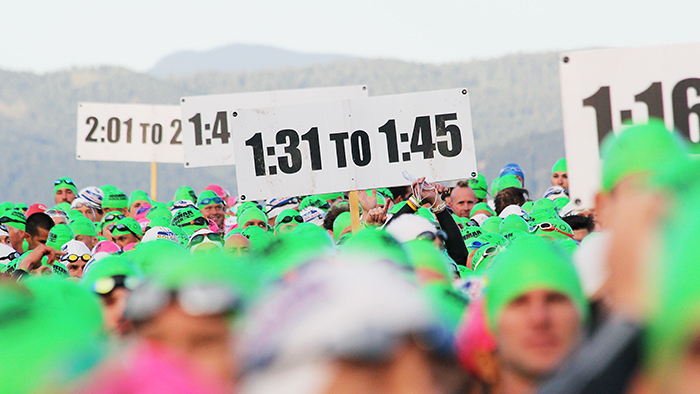 That way, on race day you’ll know what to expect, reducing your chances of any nasty surprises. You might be surprised how simply cutting down on unknowns can reduce your nerves. Map/prepare/familiarize. Make sure you take time to plan out all your logistics, including housing, food, transportation, the course, registration times, start times, etc. You should feel like you’re on autopilot for the days leading up to the race. After all, energy spent stressing is energy you can’t use to perform. Review your training logs and milestones from your completed training—it can come as a nice surprise to see how many hours/miles you have covered already. Often nerves are a result of feeling underprepared, but the hard proof can help reassure you that you’re up to the task ahead. It’s good to be aware of your “perfect day” goals (when everything goes 100-percent right on race day) but you should also have B and C goals (for when you encounter minor or major setbacks). Being prepared to adapt to any situation throughout the day will help you stay calm and perform as well as you can even when plans go awry. Head to the finish line and take a mental picture; imagine yourself finishing strong, closing in on the final kilometers on race day, soaking in the cheers and feeling amazing. The more you actively fill your head with positive images, the less it’ll fill itself with nerve-inducing negative ones!